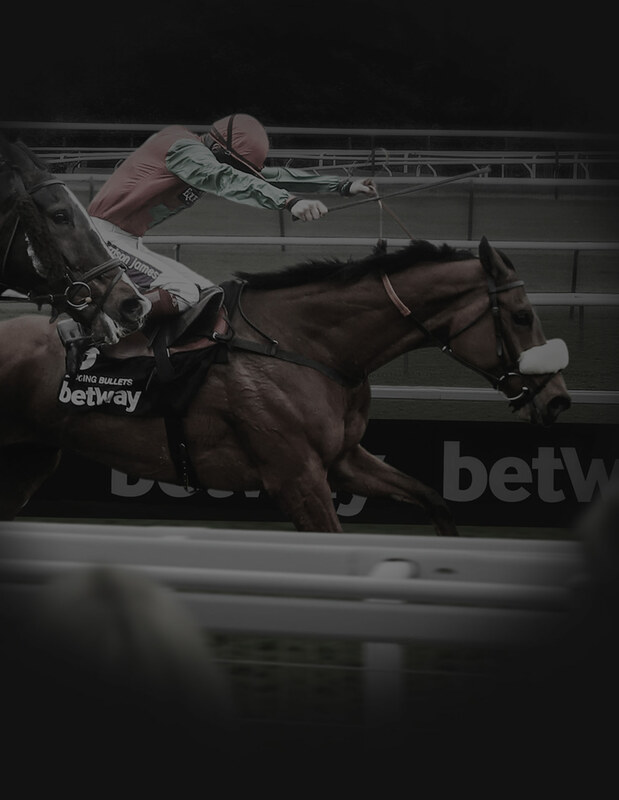 Horse Racing Betting at Betway™ - Best Odds Guaranteed, Top Price Specials, Horse Faller Refunds. *Key Terms: 1) New customers only 2) Min deposit £10+ required 3) 100% matched free bet on 1st deposit 4) Maximum Free Bet amount is £30 5) Free Bet will be unlocked after original deposit is staked, wagering at odds of 1.75+ 6) Withdrawal limitations 7) Full Terms apply. 1. The Sports Welcome Offer is a 100% Match based on a New Customer’s 1st deposit at Betway Sports. 3. To qualify for the Sports Welcome Offer, a minimum of £10/€10/$10/100kr (or the customer’s currency equivalent) must be deposited using a valid debit/credit card, PayPal account, SOFORT Überweisung or PugglePay at Betway within 7 days of a new Sports Account being registered. 6. Additional terms apply. Please refer to each relevant section below for further details. Last updated: 16/11/2015 at 07:30 GMT. 2. The Free Bet will be activated upon placement of qualifying bet/bets that reach the 1st deposit value. 3. The Free Bet will expire 7 days after the 1st deposit is made on a New Customer’s Sports Account, irrespective of it being activated or not. 4. The Free Bet offer is only valid to the person who registers the new Sports Account and applies only to Sports bets. It cannot be redeemed and is not transferable to any other product offered by Betway (Casino, Poker, Bingo or Vegas). 5. Should your qualifying bet/bets be void, push or a non-runner, you must stake the returns on another qualifying bet/bets before a withdrawal will be granted. 6. Before any withdrawals are processed, your play will be reviewed for any breach of our terms and conditions and irregular playing patterns. If any terms of an offer/ promotion are breached or if there is evidence of bets/wagers placed by a customer or group of customers (for example, betting patterns on the same events/markets that are identified across multiple accounts), which due to a Free Bet, Bonus, enhanced payment, our Cash Out feature or any other offer/promotion results in guaranteed customer returns regardless of the outcome, whether individually or as part of a group, Betway reserves the right, at our sole discretion, to void Free Bet or Bonus stakes or void any stakes funded by the use of previously awarded Free Bets or Bonuses and withhold any withdrawals and/or confiscate all winning from such voided bets. Betway also reserves the right to reclaim the Free Bet or Bonus awarded from such offers and confiscate them. 7. Additional terms apply. Please refer to each relevant section below for further details. 2. Play at certain games will contribute a different percentage towards the playthrough (wagering) requirement. Should you play on the excluded games (0%) before meeting the playthrough requirement, you agree that Betway Sports holds the right to void any winnings made from such games at its discretion. 3. The Sports Welcome Bonus is only valid to the person who registers the new Sports Account and and makes a deposit into it. The offer is not transferable. 4. Before any withdrawals are processed, your play will be reviewed for any irregular playing patterns. In the interests of fair gaming, equal, zero or low margin bets or hedge betting, shall all be considered irregular gaming for Bonus playthrough requirement purposes. Other examples of irregular game play include but are not limited to, placing single bets equal to or in excess of 30% or more of the value of the Bonus credited to their account until such time as the wagering requirements for that Bonus have been met. Should Betway Sports deem that irregular game play has occurred, the Sportsbook reserves the right to withhold any withdrawals and/or confiscate all winnings. 5. Additional terms apply. Please refer to each relevant section below for further details. 1. The Sports Welcome Offer is only permitted once per person, household, family, household address, email address, credit/debit card number or shared computer environment (example: a library, workplace, fraternity, university or school). Betway Sports reserves the right to void all winnings and play should this term be disregarded. 2. The Sports Welcome Offer may not be claimed in conjunction with ANY other promotion(s) currently offered by Betway Sports and is subject to on-going review. Betway Sports reserves the right to amend the offer and its terms at any time, including the cancellation of the promotion. 3. The Customer acknowledges that in order to be eligible for any promotion(s) they must be playing with the primary currency used in the country where they have a registered address and are playing from. Should the primary currency not be available, play is permitted in USD or CAD or EUR. Note: only customers living in the UK are eligible to register a GBP account. Betway Sports reserves the right to withhold any Bonuses and winnings resulting from deposits in any currency made in contradiction to this condition. 4. Should a withdrawal be submitted before a Sports Welcome Bonus is credited to the Bonus Account, the Bonus will be forfeited. 5. Betway Sports considers all the above Terms to be fair and by your participation in the Sports Welcome Offer you consent to abide by them. Should you require any clarification or advice regarding these Terms, please contact Customer Support. The following terms apply only to Sports Welcome Offer 1, as well as to any future Free Bet promotional offer(s) made available to a qualified customer. 1. If not used, the Free Bet will expire 7 days after being credited (unless specified otherwise in the terms of the offer). 2. The Free Bet must be used in its entirety as a single transaction/bet. 4. Should the Free Bet be placed on a selection that is later voided, the stakes will be returned to your account as a Free Bet. 5. The Free Bet is non-refundable and the Free Bet stake is not included in any returns. 6. The maximum return on any Free Bet stake is £20,000/€20,000/$20,000 (or the customer’s currency equivalent). 7. Placement of a Free Bet on an each-way market is considered one bet (including the win and place portion). The return from this bet must be greater than the total value of the Free Bet placed for winnings to be paid out. 8. A redeemed Free Bet will not count towards qualification to view streamed events. 9. The following terms apply to all Betway promotional Free Bets. Should you require assistance with any of these conditions, please do not hesitate to contact Customer Support. 10. Unless specifically stated otherwise, all deposits have a playthrough (wagering) of at least once (1), before a Free Bet specifically related to the deposit will be activated. 11. Betway Sports considers all the above Terms to be fair and by your participation in the Sports Welcome Offer you consent to abide by them. Should you require any clarification or advice regarding these Terms, please contact Customer Support. The following terms apply to Sports Welcome Offer 2, as well as to any future Bonus promotional offer(s) made available to a qualified customer. A Customer's total account balance consists of a Cash Account and a Bonus Account. Withdrawals cannot be made from the Bonus Account, but the Bonus Account can be used to place wagers. You will be unable to withdraw any amount from your account until you've either met the wagering requirements or played through all funds in the Bonus Account. Should you play on the excluded games (0%) before meeting the wagering requirement, you agree that Betway holds the right to void any winnings made from such games at its discretion. 3. As the playthrough requirements are met, funds are automatically transferred from the Bonus Account to the Cash Account – in increments of €10. a) Playthrough is achieved when any real money wager is made. b) Any wagers made are deducted from the Cash Account first. Should there be no cash available, the wager is deducted from the Bonus Account. Funds in the Bonus Account are only played if there are insufficient credits in the Cash Account. c) Winnings resulting from wagers made from the Cash Account are credited directly to the Cash Account. Winnings resulting from wagers made from the Bonus Account are credited back to the Bonus Account. d) If crediting a Bonus Account with winnings results in the Bonus Account balance exceeding the original bonus amount, any excess winnings are credited to the Cash Account. Note: this is less any automatic transfers that have occurred from the Bonus Account to the Cash Account. 4. You will be unable to withdraw any amount from your Sports Account until you have either met the wagering requirements or played through all funds in the Bonus Account to the Cash Account. Winnings on bets from the Bonus Account, after the wagering requirements have been met, go straight to the Cash Account. 5. Where a New Customer Offer has been granted to you, once all stipulated wagering requirements have been met, you will be limited to a maximum withdrawal value of 6 times your first deposit amount and any remaining balance will be forfeited. This clause will only be applied at the discretion of Betway management. Note: Progressive Jackpot wins are exempt from this clause. 6. Betway Sports reserves the right to limit withdrawals from any Free Bonus/Free Games/Free Spins added to a customer’s account to €100. This limit will apply should a Bonus be granted with no deposit being made unless specifically stated otherwise in the promotional offer. Last updated: 01/12/2015 at 16:06 GMT.